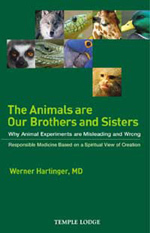 Respected surgeon and medical doctor Werner Hartinger investigates the claims and counterclaims concerning experimentation on animals. Through meticulous analysis he comes to the conclusion that animal experiments are not only unnecessary, but that the experiments themselves are questionable and lead to meaningless results. The cruelty imposed upon animals is therefore not only gratuitous, he argues, but is unhelpful in the development of good medicine for human beings. Hartinger writes from many years' experience within the medical profession, and with ample scientific data to back his findings. He also tackles the spiritual aspect of this question, inspired by the work of the Austrian philosopher Rudolf Steiner. Painting on a vast canvas, he demonstrates the sibling relationship between humans and animals in the context of cosmic and spiritual evolution. The author gives a commentary on Christian teachings regarding animals, examining the biblical commandments. He also studies the varieties of diseases and their causes, and the hidden aspects of sickness and health. WERNER HARTINGER, MD, was a specialist in General and Accident Surgery and a practitioner for the Industrial Injuries Insurance Institutes, with over 30 years' experience in hospital and private practice. He held degrees in Internal Medicine, Gynaecology, Obstetrics and Anaesthetics, and was the Chairman of the German League of Doctors Against Animal Experiments as well as a Patron of Doctors in Britain Against Animal Experiments. He died in 2000.